You heard it here first folks, in one year’s time, the quaint streets of Madstop will echo with the roar of top-level motor racing. Just hours ago, the USCR announced the inaugural running of the “24 Hours of Madstop.” The twenty-four hour endurance race will be held April 13-14 of 2014, as a flagship event of the new United Sports Car Racing (Formerly the American Le Mans Series and Grand-Am). A USCR representative speaking on condition of anonymity told the Instigator that the new road race will claim the spot on the calendar formerly occupied by the “Tequila Patròn American Le Mans Series at Long Beach,” sponsored by Patròn and run in Long Beach, California. This same representative went on to explain that Madstop was chosen to host this prestigious event from a list of other top-flight venues including Honolulu, Washington DC, and Las Vegas, as well as foreign destinations including Rio de Janeiro and Montreux (on the Lake Geneva shoreline). 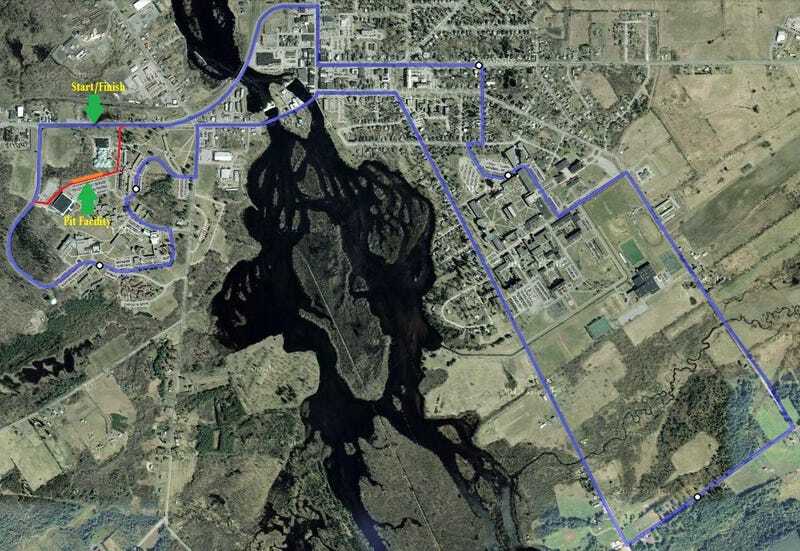 The course is set to follow a 7.9 mile, thirty-one turn loop winding through town, including portions of the SUNY Madstop and Clarkston campuses. Beginning at the start/finish line directly in front of the DZ Sorority House, racers will dive down Route 11 into the fast, sweeping left hander of Turn 1. Following the course of the road through Turn 2, the ninety-degree Turns 3 and 4 bring the pack onto Elm Street. After passing the house of the Instigator’s faculty advisor (a noted racing fan), the field will take another hard right onto Cedar Street. Turn 6 is another abrupt right-hander, followed almost instantly by an obtuse hairpin, taking the race into SUNY Madstop’s campus. Turns 9-13 bring competitors through the University and onto Main Street. After a brief 0.9 mile sprint, the cars will execute another right-angle turn onto Garfield road, followed by another onto Pierpont Avenue. Here begins a 1.5 mile long charge back to the center of Madstop. Rocketing down this arrow-straight ribbon of tarmac, throttles pinned wide open, all classes will likely reach the upper limits of their straight line performance – nearly 200 mph for the top, P2 class. After hurtling through “Firehouse Corner” and over the island, drivers will make their way onto the Clarkston campus. Executing Turns 21 and 22 – the “Chubley-Raymond Chicane,” the course continues to weave through Clarkston, passing all dormitories and academic buildings. After clearing Pit-Out and penultimate Turn 29, the pack will pull one final right hander back onto Route 11. The Instigator reached out to several top drivers for their thoughts on the circuit. Oliver Gavin of Corvette Racing expressed eager anticipation at the prospect of racing at Madstop: “From what we’ve all heard so far, I think the Madstop race is going to be one of the best of the season. It looks an even more complicated and technical course than the usual fare, so it’s going to be real challenge. But challenges are what make great races.” TRG’s Kévin Estre also weighed in positively: “I’ve never raced in Northern New York before, so I’m really excited to gain experience in a new, up-and-coming locale. I especially can’t wait to get a piece of that world-famous Madstop nightlife!” The Instigator also reached out to Patrick Dempsey, owner/co-driver of Patrick Dempsey racing, for comment, but was told by his secretary that he was “Too busy being dreamy” to speak at that time. Organizers and drivers aren’t the only ones excited though. Officials from Madstop and the surrounding areas are elated at the propect of millions of dollars of revenues flowing into the pockets of local business owners, and that’s no joke. In view of this, the Madstop town government has agreed to pay for the construction of temporary track facilities, such as crash barriers and the pit area. In an effort to economize and inject a rustic, Adirondack feel to the weekend, the usual Armco barriers seen at other circuits will be replaced by a much more cost effective system hailing from the golden age of motor racing: earthen berms supplemented by locally-sourced hay bales and old tires. In lieu of seating for spectators, the school board has authorized the temporary relocation of the Madstop High School bleachers to the Trench lawn on the Clarkston campus, in order to provide grandstands and a press box. However, many spectators will likely choose to set up their own chairs along the length of the route, as is the norm at Lime Rock and Mosport. As a Clarkston student, though, you needn’t worry about seating. You’ll be able to experience all the sensory excitement from the comfort of your dorm room! You’ll have a twenty-four hour, front row seat to the shrieking engines, squealing brakes, shuddering suspensions, hissing turbos, and crunching composites, not to mention the permeating perfume of gasoline, scorched breaks, and burnt rubber. Whether you’re a hard-core race fan or a casual bystander, the spectacle will simply be impossible to ignore! Keep checking the Instigator in the coming months for updates, and make sure you don’t miss what is sure to be the most significant event in the history of Madstop! Full disclosure: I wrote this for the April Fool's issue of my college's newspaper, The Clarkson Integrator. I write a sort-of-weekly-ish automotive column, if the response for this is good I'll post a few more up.